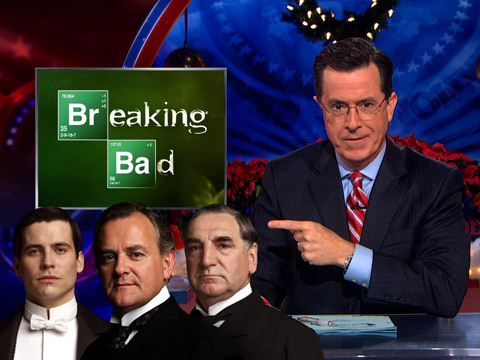 The ‘Downton Abbey’ Cast Spoofs ‘Breaking Bad’ on the ‘Colbert Report’!!! We don’t usually post stuff like this on here, but this was too good to not share with you folks. Last night on the ‘Colbert Report‘, Stephen Colbert premiered brand new scenes from ‘Breaking Abbey‘. Confused? Well it was the cast of ‘Downton Abbey‘ spoofing ‘Breaking Bad‘ with stars Hugh Bonneville, Jim Carter, and Rob James-Collier cooking meth and dealing with baddies. It was amazing. So don’t forget, the season 3 premiere of ‘Downton Abbey‘ premieres on January 6th, with the last season of ‘Breaking Bad‘ airing in the summer. Enjoy the video. ‘Downton Abbey’ Receives a 4th Season!!! Stephen Colbert Will Take Over ‘The Late Show with David Letterman’! ‘Downton Abbey’ Returns for 5th Season With New Characters!!! This entry was posted on Friday, December 14th, 2012 at 10:49 am	and is filed under News, Television. You can follow any responses to this entry through the RSS 2.0 feed. You can skip to the end and leave a response. Pinging is currently not allowed. Holy hell that was great…yeah, take THAT Obama:) Awesome post! « ‘The Hobbit: An Unexpected Journey’ Film Review!!! Nurse? I need another cup.